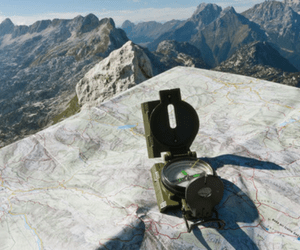 The compass is one of the most crucial hiking essentials. Whether you have invested in high-end GPS system or smartphones with GPS facility, all of these have a limited lifespan. Once the battery runs out, you are pretty much at nature’s mercy, and navigating nature can be a challenge like none other. This is exactly where the old school hiking tools like the compass come to play. They are reliable, not dependent on batteries, extremely durable and have a proven track record of accuracy. Most importantly they are your most reliable backup plan too. They step in where every other option gives way. They also have a distinct advantage over most conventional electronic gadgets. 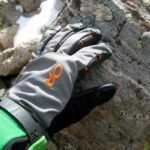 These are lightweight, hassle-free and easy to understand adaptations that mimic nature’s way quite closely. Imagine how our forefathers used just the North Star to guide them. Well, the compass is also entrenched very closely with these ancient findings, and that is what gives it a definitive edge over many other sophisticated navigation alternatives. But the point is just like our forefathers, even you need a basic navigation knowhow to be able to successfully get your bearing and move ahead. 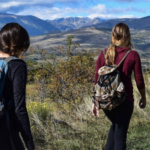 The most important question at this juncture is how you decide what the best hiking compass is. It is such a simple device that there are just two or three features that you may think how it matters. But the fact is that the accuracy of the compass is crucial. 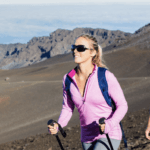 It is one of the most indispensable hiking gear to get dependable coordinates. We decided to make the task a little simpler for you. 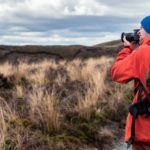 We have reviewed some of the best known and most affordable compasses to help you decide on the best hiking compass that you may rely on in your next trip. 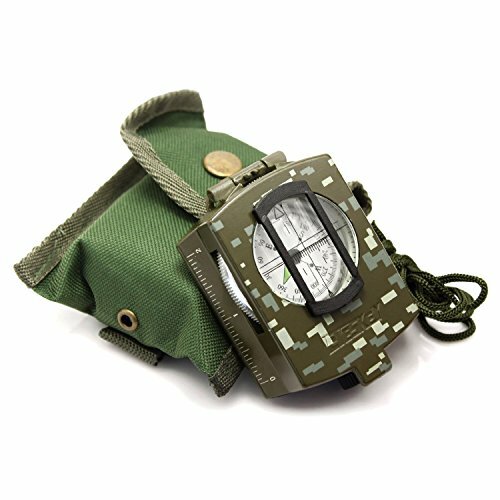 When you are deciding on the best hiking compass, this one is a compact mirrored variant popular for its extremely accurate and reliable coordinates. From directional measurements to extra sighting, ever element is enhanced in terms of providing proper directional analysis for the users. 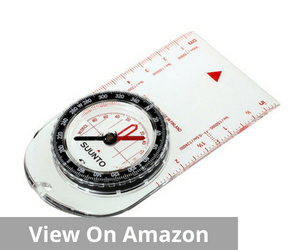 Moreover, this is a compass that works effectively in practically any corner of the world. Its global needle is known for its reliability and superior performance record. 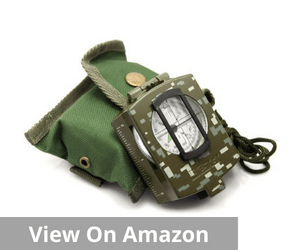 This compass comes with the base plate and magnifying lens and can be carried conveniently in the pocket. 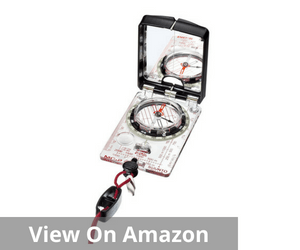 The good news is this hiking compass works brilliantly even in areas that are popular or known for large magnetic variation. But this one does not disappoint. Its fixed declination adjustment system facilitates a decidedly sharper coordinate assessment. This is also known for allowing a steeper swing angle. There are some unique and special features that add to the overall accuracy of the device. The additional sighting hole adds to the relative precision that you expect. Additionally, this compass facilitates easy direction measurement at night too. It is equipped with a luminous bezel and markings that makes for easy reading in low light and at night. That is undeniably one of the most important features and what perhaps sets it apart from the crowd in many ways. The Suunto Logo right on the compass dial interferes with the clarity in seeing the grid lines and needle alignment. 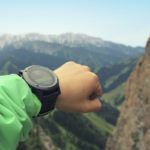 The Eyeskey multifunctional hiking compass may well be considered one of the best hiking compasses on the basis of the features it encompasses. But our readers must keep it in mind that this is one of the very few products on Amazon which does not have any customer review. It may be because users did not find the product useful or it has been added to the Amazon retail portfolio only recently. In either case, there is no way of knowing the actual extent of the benefits that this product encompasses. Most of the analysis is on the basis of what the company lists as key features. 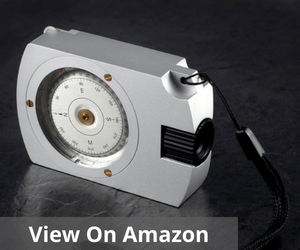 This is an interesting and innovative compass that also has two dials. One of the dials is used to calculate the azimuth degrees while the other one is for measuring distance on the map. However, one thing is clear; you do need some understanding about direction and maps if you want to analyze information appropriately from it. 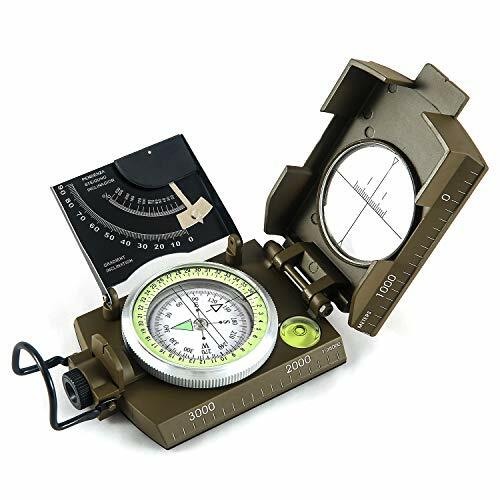 The floating compass dial offers a high accuracy 360-degree scale, and the entire compass is made of aluminum alloy. It is filled with damping liquid and offers the potential for durability. The quality of the measuring wheel and its alignment holds out a promise that it will last for a long time. Apart from that, this product also comes with a 100% money back guarantee to highlight a certain level of commitment from the company. No direct user reviews to properly assess the negative points if any. But per se this appears to be the kind of compass that requires a basic level of know how to help its users properly calculate their coordinates. This is another striking offering from Eyeskey. 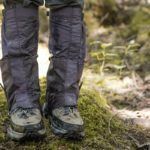 In terms of size, weight, and features, this is precisely what is required to make a winning combination of your hiking trips. 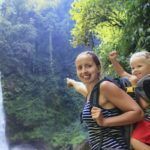 In fact, this waterproof device is amongst the best hiking compass that you may opt for while going for long and difficult hiking trips. This compass has some unique and highly dependable features built in. In many ways, that also adds to the relative accuracy of the device. 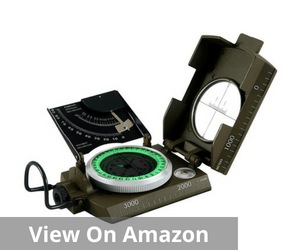 The rugged metal casing coupled with the adjustable and luminous marching line offers a definitive edge to the overall quality of reading that you can hope to get from this compass. The liquid filled luminous dial along with the magnifying viewer and the floating dial add to the readability of the compass. It also makes for easy reading of coordinates in low light condition. Moreover, it also enhances low light viewing make this an indispensable companion on any trip that you may be going for. Whether you are lost or not, whether you are a novice or veteran, this is the type of compass that can help you in just about any situation. But you surely need to understand how to read your coordinates for effective understanding of the direction. However, the company has put several alerts to be careful about fake products and potentially illegal sellers pelting inferior products with the company’s brand name. In this context, you must be careful about the seller that you are buying the product. It is best to go for only the authorized sellers. In this way, you can easily avoid potentially fake offerings. Accuracy is not the best strength of this compass. A close study of the product will reveal that the bullseye is actually not aligned horizontally with the baseplate of the compass. Moreover, the top ring, in this case, is eccentric to the main windrose. As a result, there are great chances of 2-3 degree error in the actual reading. That can result in a serious problem, especially if you are lost or do not have any other backup to confirm your coordinates. 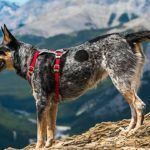 The next offering in our list of the best hiking compass is another alternative to the Eyeskey stable. 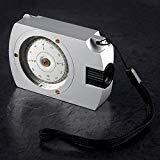 This is another multifunctional aluminum alloy compass that surely strengthens your sense of direction when you are on a hiking trip desperate to get the right direction and proper coordinates. 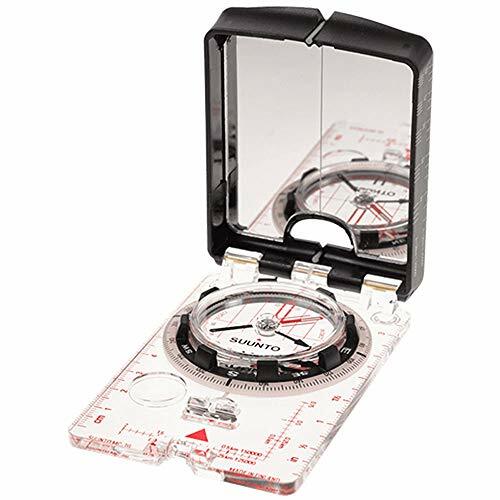 This compass comes with a high strength engineering metal body and what makes it special is that it can help you with proper direction even in extreme weather conditions. It is rugged and perfectly capable of keeping you safe when every other device fails you. This is the compass that can also hold you in good stead in extreme low light conditions and at night too. This is because it comes with a fluorescent light that helps you to read sightings even in the dark. The built-in bubble level represents a very high accuracy rate and makes room for more perfect reading with limited scope for error. It is also waterproof and shockproof. That means, it represents a much better scope for better reading and accurate coordinates. Needless to mention that also enhances the value of this compass to a large extent. The lifetime warranty that comes with the product is undeniably an added advantage that also makes it more attractive for users. 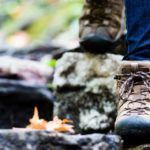 If you are looking for a classic, convention, and yet a modern compass, this is one of the best hiking compasses. The Sunnto A-10 is a highly functional and an extremely multipurpose compass that enhances your sense of direction on a hiking trip. This is undeniably one of a kind device with an eye for precision and quality. This compass comes with a high-grade steel needle and jewel bearing. It is properly balanced towards the earth’s magnetic pole and has proper declination correction scale. Needless to mention that is what makes it both a precision based and effective compass. It has a detachable snap lanyard that also enhances its usability to a large extent. However, user reviews also point to the fact that there are some distinct inconsistencies with the actual product and what is shown in the company’s listings and photographs. So, users should carefully study the markings and the overall return policy to be sure that they have the right product. It also makes sense to buy from genuine authorized sellers, even if it means shelling a few extra bucks. 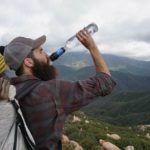 So when you are buying the best hiking compass, it is very important to pay attention to the most important details of the device. That will, after all, go on to help you decide on a winning combination. There are some features that are considered an absolute necessity. In many ways, they are the ones that go on to determine the accuracy of the calculations and the extent of the reliability of the company. The compass needle is practically the heart of the compass. Normally the red end of this needle points towards the magnetic pole and helps you determine the direction more accurately. Most manufacturers make this needle float in a damping fluid to get steady movement. The quality of this fluid is significant for accurate needle reading. But if this fluid forms bubbles, it can surely impact the overall accuracy of the compass. So when you are buying a compass, it is essential to verify the authenticity if this needle. The next important element in a compass is the rotating bezel or the azimuth ring. The best hiking compass is undeniably the one that gives a proper reading of the degree that is marked with this ring from 0 to 360 degree. The varying degree is marked on the outside edge. You have to make sure that the interval between these marking is small. Often the extent of accuracy is determined by the gap in this azimuth ring. So you can well understand how even the smallest changes make a big difference in the overall accuracy. This is what comprises the lower end of a compass. 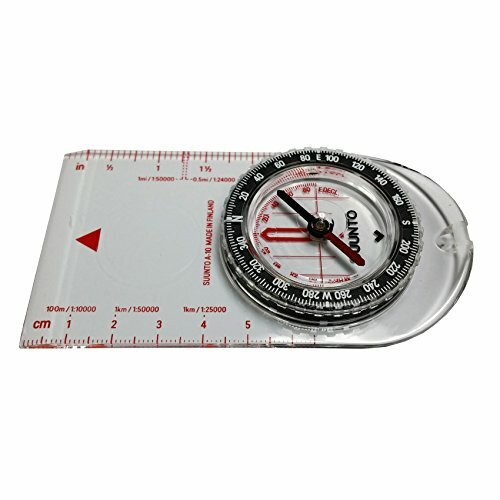 When you are busy looking for the best hiking compass, make sure that the markings on the base plate are accurate. Ultimately that goes on to determine the accuracy of the compass. The wide range of navigational markings, ruler to measure map distances and a gamut of orienting arrows and lines together work towards creating a meaningful and dependable compass. Together these play a very important role in deciding on a wide range of navigational details and markings. That is how you can eventually determine the distance and get a more realistic idea of the coordinates. Magnifying lens: Though not a compulsory feature, there are some compasses that have this lens inserted on the base plate. Needless to mention, it makes reading maps a lot easier. Luminescent indicators: This is important if you are starting before natural daylight sets in or are not finished well after sunset. This, no doubt, makes reading the compass notifications a lot easier. While most times additional features can add to the convenience, you should also be careful about possible fake accessories. You often have key rings or watch bands that are compass lookalikes. But don’t make the mistake of considering these for serious navigation. The needle-inserted on a base plate is what comprises an actual compass. That alone is capable of providing accurate coordinates to you. 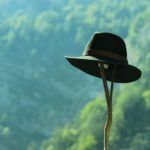 So when you set out to buy the best hiking compass, remember less is always good. Don’t be too bothered about the extras. The most important is the fundamental elements. That goes on to help you calculate the basic coordinates in the first place. So if you are looking for an effective piece of navigational genius, stick to the old styled compass with some modern innovations to enhance your overall experience in calculating appropriate direction.